Since embarking upon an exploration of participatory performance art my research and thinking has been centred around the new concerns this medium throws up for me. A large part of that has been around audience engagement and participation, how levels of consent and safety affect the appreciation of the work and how this can be achieved for your audience without compromising the work. Invariably there is work in the contemporary artworld that shocks, disgusts and creates discomfort in the viewer. When responding to an image or an object, the viewer has distance and a level of detatchment from the artwork, so if the discomfort is too great the viewer can turn away. How does this function within an immersive environment? Even when an artist may not intend discomfort, an audience member may still experience it and the artist needs to take this into consideration. 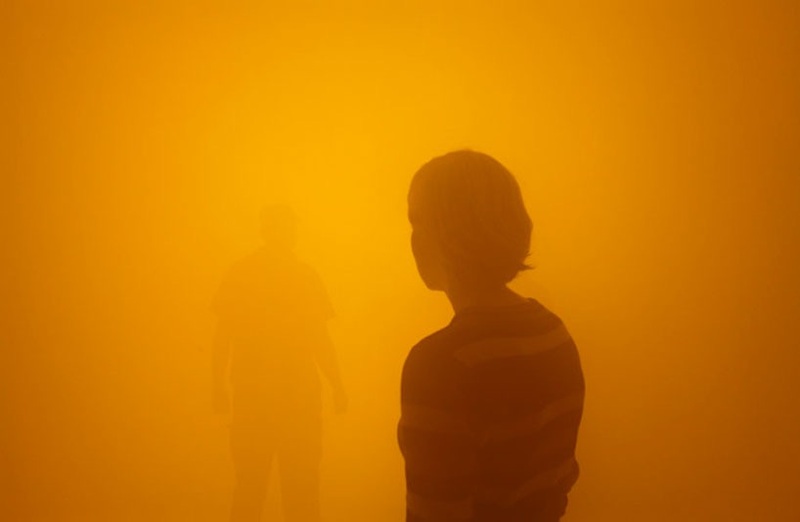 Olafur Eliasson’s “Your Blind Passage” (2010) requires the audience take a bold step into the unknown by entering a passage with no prior knowledge of it’s interior. Once inside, the viewer has to rely on senses other that sight to navigate as the density of smoke and coloured lights makes it impossible to see more than a short distance. In the gallery space the audience member has the option to enter or not enter the work depending on their level of comfort and they do not have to enter the space alone. Once inside the work the viewer could choose to leave if the experience was unpleasant for them. This allows audience members to give themselves over to full engagement with and experience of the work without feeling uneasy about their place in the environment. Other works offer the option for engagement or observation. “Imponderabilia” (1977) Marina Abramovic and Ulay, creates a doorway from two naked bodies facing each other. If an audience member squeezes through the gap they must choose which body to face. This piece gives the audience the option of either participating in the work or watching others participate in the work. The experience will be different depending on which option the viewer chooses, but the ability to make that choice is given and that allows the viewer to feel comfortable in their decision. A work such as Tino Sehgal’s “This Progress” (2010) requires a far more active participation from the audience. Rather than being explorers (Your Blind Passage) or having a brief but potentially intense interaction with the work (Imponderabilia) ‘This Progress’ envelops the audience fully into the work for an extentended performance. 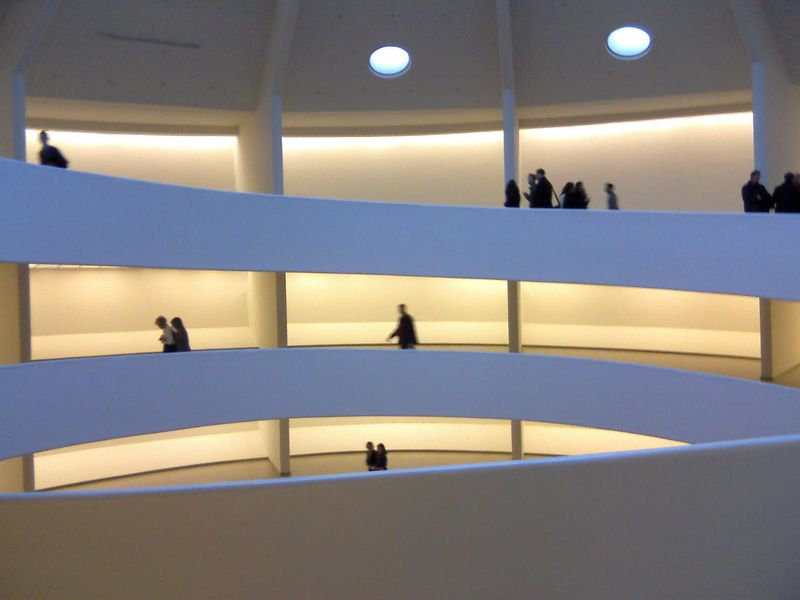 Although the experience of passing up the spiral gallery of the Guggenheim talking with performers doesn’t sound confrontational or discomforting, there is still the aspect of venturing into the unknown that has to be overcome by the audience. Their trepidation would certainly be allayed by the fact that the travellers can journey through the work in small groups, they can also see ahead of them and behind them, there are also no uncomfortable situations to be faced except for questions around the nature of progress. Apart from discomfort related fear of the unknown the other aspect of my work I need to contend with once again is the issues around dealing with exclusionary subject matter. 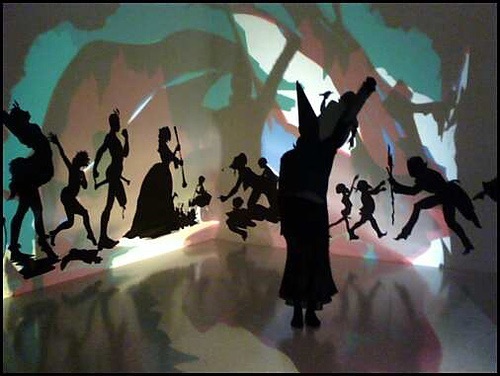 I went back to looking at Kara Walker and the way she addresses racism in the Antebellum South. Her large installations are quite enveloping so a viewer could be well within the artwork before noticing that the charming silhouettes dancing around the walls are not so charming after all. There are bound to be viewers who are disturbed and upset by the scenes, but the nature of the work means that they have enough distance from the images that they may just move away and leave the installation. When working with the symbolic language of ritual one has to be very careful to strip away any excess symbolism that could have a negative effect on the work and only keep that which is truly useful. I’ve been creating some costumes for a performative piece and have changed them and rethought them several times to make sure that they retained the associations with ritual and mysticism while avoiding any problematic or unnessary connotations. 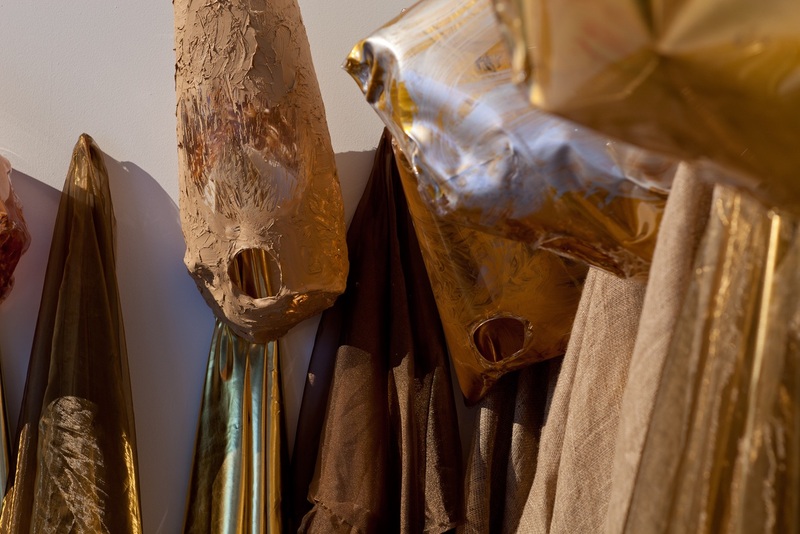 I examined Mikala Dwyer’s use of ritual costuming in her work ‘ Goldene Bend’er’ (2013). She uses hooded robes which immediately evoke ritual and the occult, she even has some pointy hoods which can be a very difficult and potentially offensive choice. The way she changes the robes and creates her own ritual garb is to use unexpected materials such as gold lame, lurex and covering her mishapen hoods in strange material and textures. This way she effectively maintains the associations she wants to keep and removes those she does not. This has been a very valuable observation for me and something I need to keep pushing in my own work. Dwyer maintains a distance between audience and ritual performance, they are observers not participants so they maintain a level of detachment. Each of these artists have strong, well known practices. This gives them a bit of freedom to push the boundaries because viewers have some preconceptions around what to expect; they know that a Kara Walker work is going to contain some racially provocative images, that an Abramovic piece is likely to be confronting and that Tino Sehgal will probably have some audience participation. As these works are on display in public spaces the options for viewers to choose to engage with the work are totally open. For my work, in an educational setting, where I benefit from feedback from my peers, I need to make sure that the work is accessible and viewers are comfortable in engaging with it without taking away from the experience of the performance. Posted on 07/05/2015 07/06/2015 by marymacgregorreidPosted in Contemporary Art Practice, General Research, Performance, SymbolismTagged contemporary art, Exclusionary Subject, Mikala Dwyer, Occult, Performance, research, Symbolism.